The QF80 Reflector replaces the standard reflector included with the Quantum Qflash and permits mounting 67mm threaded filters to produce narrow or broad band wavelengths of flash illumination from Ultraviolet to visible to Infrared. The illumination bands can range from non-visible Ultraviolet (350-400nm) to visible to non-visible Infrared 700nm and above. 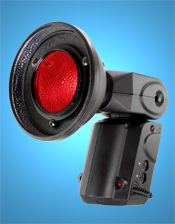 The Qflash provides a single portable light source for UV/IR or conventional cameras. By using various filters on the UV/IR Wave Reflector, and on the camera lens, photographers can record pure UV effects, UV fluorescence, blue or green visible fluorescence, and IR imaging. For additional information on the Qflash please click here.